Transformers 4: Age of Extinction hit theaters this weekend and signaled the start of a brand new trilogy in this Paramount/ Michael Bay cash cow. Although with the past two installments being less than stellar, is this film just another flop hidden behind amazing special effects; or is it the sequel we’ve been waiting for? With a great new cast, an exciting linear story and an amazing balance between the human and robot element, this film transformed the dying franchise and brought it back to its former glory. Did this film recapture the magic and novelty of the first Transformers? No, but you wouldn’t expected to. This might be a brand new trilogy; but it’s not a complete reboot. The story and events of the first film still happened. People still know about Transformers in the world of this film. That being said, this film does help you to forget everything that came before; and focus on a brand new story that exceeds anything that came before. If this film was Ted with robots . . . I’d be perfectly content. Even before you go see the film, you know there’s going to be a different cast; and rather than seem strange, it’s actually very refreshing. With Shia LaBeouf’s character being annoying – and LaBeouf himself doing whatever it is he’s doing lately – the bar wasn’t exactly set too high for Mark Wahlberg to take over as a mechanic/inventor named Cade Yeager. Ridiculous names aside, Wahlberg is actually amazing in the film; and unlike his predecessor Cade is actually a very respectable character. Joining the main cast of heroes is the beautiful Nicola Peltz who plays Cade’s daughter Tessa, and Jack Reynor as Tessa’s boyfriend Shane. 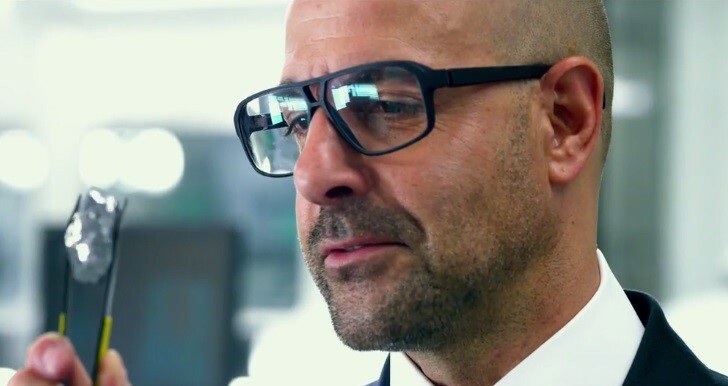 Stanley Tucci takes on the role of the entrepreneur Joshua Joyce who ping pongs back and forth between brilliant and hilariously awkward. Although it is Kelsey Grammer who steals the show as the menacing and corrupt Harold Attinger. Remember how brilliantly he played Beast in X-Men: The LAst Stand or Frasier in Frasier? Well imagine him evil and corrupt. Heroes and villains aside, there is also a strong supporting cast. Bingbing Li plays one of Joyce’s business partners and she was a complete surprise. Besides being incredibly beautiful, she played her role stunningly and had quite a few defining moments that she owned completely. I thoroughly hope Li – along with the majority of the cast – returns in the rest of the trilogy. They all contributed to the film being less of a teenage-drama-run and more of a grown up film with a lot of heart and a strong statement on some of the problems facing modern society. It’s easy to forget that the Transformers themselves are part of the cast too. As with past films, they get lost in the story and seem secondary. It’s almost like they’re only there to provide action. This film changes all of that. This time around, they not only showed their worth as characters; but also showed definite moments of character development. Don’t expect to find the Transformers unchanged since the events of the last film. You shouldn’t even expect the Transformers to be unchanged by the end of this film. For the first time in this entire series, there is actually clear and apparent character growth for them. Optimus is no longer the unmoved pillar of the Autobots. He will doubt; he will change; and he will grow into the driving force of this new trilogy. The cast wasn’t the only thing that made this film feel fresh and new. This time around the humans aren’t there to be rescued by the Transformers. Nor are they there to be the end all saviors in their age-old war. There’s a human story and a transformer story working hand in hand here; but rather than take spotlight away from each other, they meld perfectly while still remaining distinct and separate. It’s hard to explain this without spoiling things; but for example you’ll see in the film that there are times that Optimus saves Cade and his family; but also times where Cade isn’t afraid to literally fight along side Optimus. Each has their own stories; yet aren’t afraid to help the other out along the way. The only drawback for the story is that it’s long. The film is almost 3 hours long; but there was no other way to do it. Yes this movie has a lot going on; but it’s a strict progression of events. There are no annoying smaller side stories that take away from the action. Everything feeds into each other amazingly and even sets up for the rest of this trilogy. As I’ve hinted already, this is a more mature film. The past three relied way too heavily on awkward/sophomoric horny humor. This film on the other hand was quite funny, but had a much more varied approach to the laughs. Is there a childish joke here and there? Sure, but it’s no longer the only item in their bag of tricks. Remember, Mark Wahlberg plays the overprotective father of a ridiculously attractive daughter played by Nicola Peltz; and there are tons of laughs from that path. Throw in some insults, name calling and hilarious moments of sarcasm; and you have a film that has actually grown in not only quantity of jokes; but also the quality. Let’s face it. When you go to a movie about giant robots fighting giant robots, you expect there to be action. 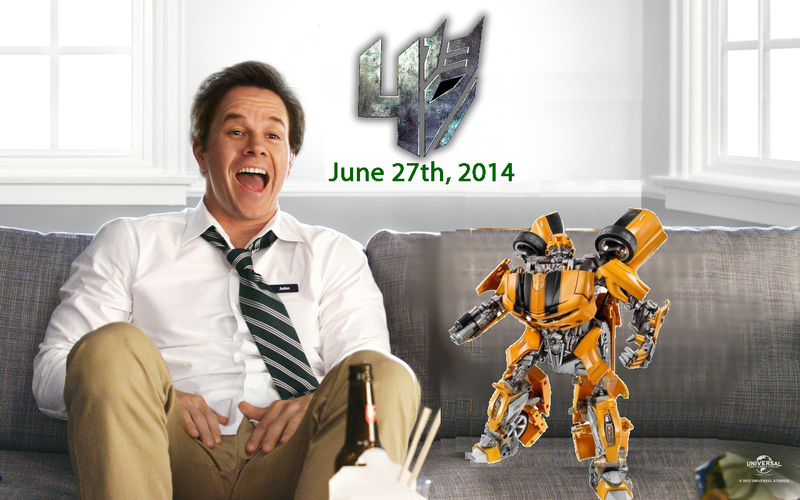 Transformers 4: Age of Extinction does not disappoint. There are tons of action scenes that are not only amazing; but are perfectly placed within the movie. They’re not there for action-sake. There’s actually purpose behind these scenes. As always, the effects in a Michael Bay film are over the top, amazingly executed, and abundant; however, there was one moment in the film where they might have gone a little too far. I will warn you that there is a portion of the movie that takes place on a spaceship and it is just murder for your eyes. From the dark background interspersed with bright flashing lights, my eyes were killing me for a good portion of time after the film. Beyond the eye strain in that one scene, the effects are good. My only other complaint here is the transformation sequence for Galvatron and a few other transformers. Its weird, awkward and is honestly something I hope gets fixed before the next film. That being said, the effects for these transformations are purposeful and story-driven. I’d say more, but again, this is a spoiler free review. One thing that absolutely stood out about this film and sets it apart from its predecessors was it’s use of source material. The inclusion of Dinobots was one thing that drew a lot of fans of the original series to this movie; but it didn’t end there. I can’t go into much detail here – so wait for my spoiler filled article due out tomorrow – but there are a couple other things in this film that use source material in one way or another. Nothing in this film will happen EXACTLY like it did in the cartoon, comics, etc; however, there is absolutely a clear and present desire to honor the classics here unlike the past installments. Overall, what we have here adopts the history of Transformers and makes it relevant for both old and new fans. So there you have it. Transformers 4: Age of Extinction is definitely worth seeing and honestly corrects a lot of the mishaps of the past few installments. With a new cast, better understanding of source material and a balanced story this film hits all the points I wanted it to. Could some parts have been better? Sure. Could it have been shorter or have special effects that didn’t hurt my eyes? Definitely. Though despite those drawbacks, this is still the Transformers film we needed. After two mediocre to awful sequels, this film finally brought us back to the wonder of Transformers. 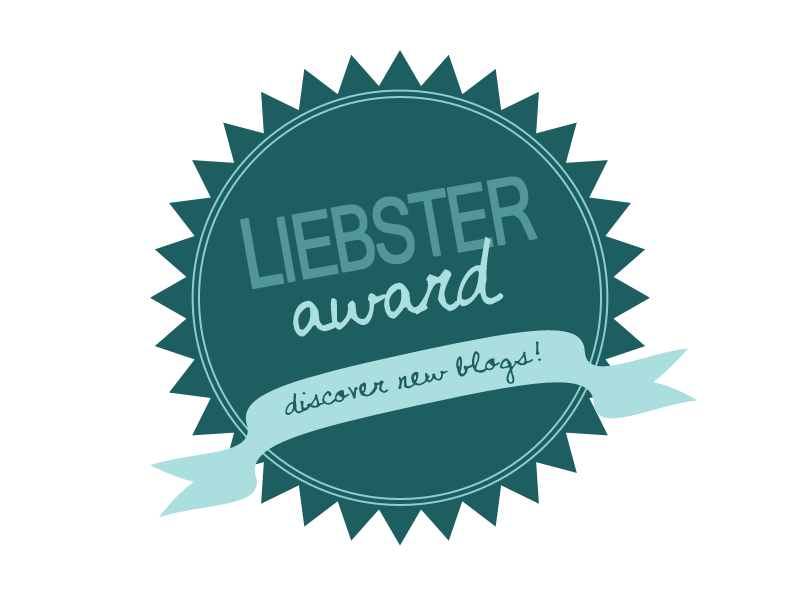 SPOILER ALERT…DO NOT READ THIS UNLESS YOU HAVE SEEN THE MOVIE……. What were the Dinobots doing in Lockdown’s ship ? how did he even capture them in first place ? I understand that the ship was meant for knights and cape crusaders but how did Lockdown capture the Dinobots and put them in prision. Mystery number 2: Where did Optimus head off to in the end ? was he off to find his creators or going to a distance space to hide the seed ? – He went to go track down his creators. Again these are actually very complex answers so please stay tuned for my article due out later today (in a few hours).